Those that know me well know that I love my Asian food. Familiar foods equal comfort food, right? But once in a while I'll switch things up a little bit. A while back my boyfriend and I decided to stop by one of Edmonton's well-known established restaurants for dinner. Parkallen Restaurant has been around for as long as I can remember. Literally. Back in the day my parents owned and operated a small Korean restaurant right next door, and to this day they often remind me that I used to run around our restaurant and would visit Parkallen from time to time. The memories are vague so I figured it was time for a visit to see if anything would jog my memory. 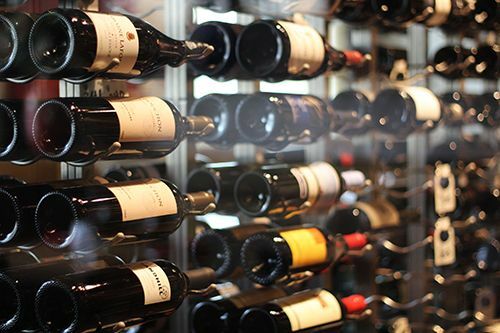 When you first walk in to the restaurant you're greeted by a grand display of wines in the wine room. 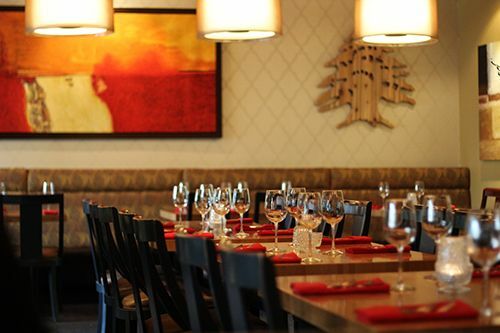 The restaurant is well lit and decorated in shades of red, yellow and orange, making it feel warm and inviting. On arrival we were greeted promptly and seated in a location of our choice in the restaurant. Although we were the first patrons to arrive for dinner at 5:30 PM, the dining room quickly filled up within the half hour for a busy dinner service. 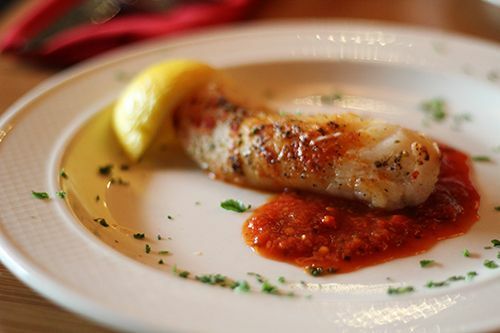 After some brief explanations from our server we decided to start our meal with the Samaki Harrah ($16): catch of the day in a red pepper coriander sauce. That night the restaurant was featuring cod and it was cooked soft and flaky. The red pepper sauce was flavourful without overpowering the dish and the size was just right to prepare us for our entrees. 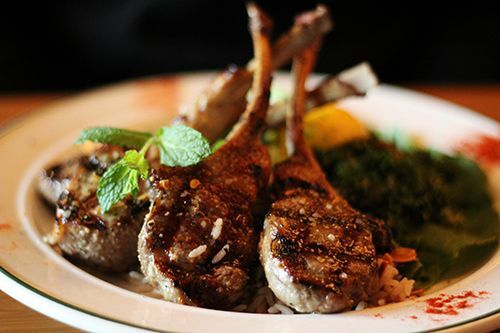 For myself I chose to go with the Spring Rack of Lamb ($45) with tabbouleh salad and Lebanese rice. When I'm out for dinner and lamb is on the menu, I will always order it. Parkallen grilled these ribs beautifully as they came out juicy, tender, and the light seasoning allowed for the flavour of the lamb to come through. Of the two sides I really enjoyed the tabbouleh salad, as it was crunchy, tangy, and full of flavour. The rice wasn't anything to write home about, but it was subtly sweet with thinly sliced almonds and hints of cinnamon. Our dinner ended with some cheesecake (not pictured, $10) and caramel pecan flan ($10), both of which were a nice way to end the meal. The desserts at Parkallen are brought in from elsewhere, but I wish they had something available that they make in house. 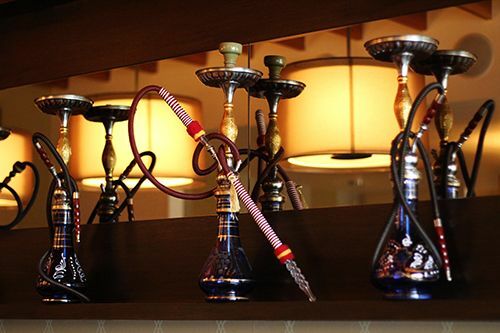 Throughout the dinner we were very well taken care of by our server, and other staff were equally as attentive. Our glasses of water never reached half empty but the servers weren't overbearing either. 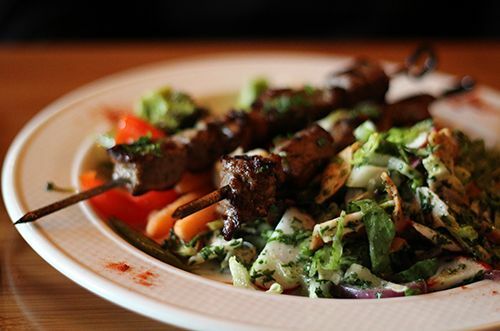 As Parkallen describes themselves as a Lebanese and Mediterranean fine dining restaurant, it is definitely reflected in their service and pricing. This is not a restaurant you'll be frequenting often, but I would recommend it for celebrations and special occasions. On the other hand, a portion of the menu is dedicated to pizzas made in house. Perhaps it is time for another visit, as I'm curious to see what they have to offer! As a little girl I loved having my own little tea parties. Animals seated around the table, sipping their tea and eating their scones. Nowadays tea parties aren't my thing, but garden parties? You bet. A few weeks ago Blink Edmonton announced that they would be hosting a garden party in one of the most beautiful gardens here in Edmonton - at the Fairmont Hotel MacDonald. With the intent of fundraising for the Edmonton Humane Society, I didn't hesitate to purchase a ticket! During the time leading up to the event I had no idea what to wear. I knew I wanted something bright that screamed summer, and the pieces in my closet weren't cutting it. Do you ever stare at your closet full of clothes and feel you have nothing to wear? It's the worst feeling! One day I walked into one of my favourite local boutiques and strolled around aimlessly. Nothing on the racks had captured my interest. As I turned around and was about to leave, this dress was off to the side and immediately caught my eye. 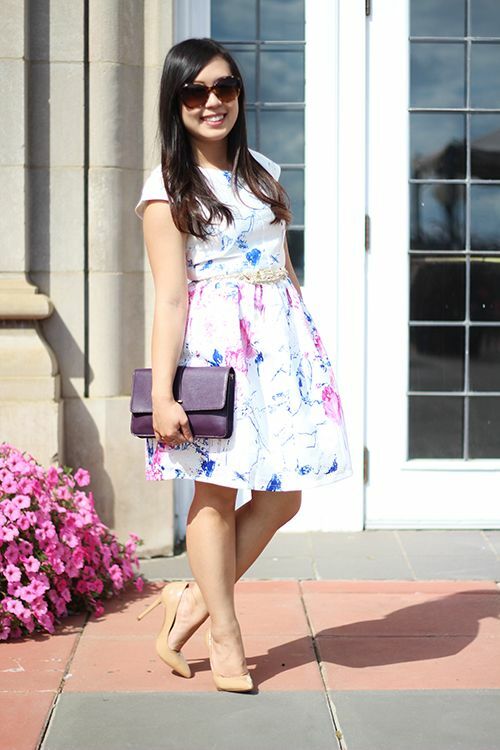 The feminine silhouette featuring the blue and pink splatter against the crisp white fabric was just the right amount of girly. Once the dress was zipped up it fit like it was made just for me. Perfection. It's not everyday that you see a city girl like me out on a farm. Last week I was invited out by the Alberta Canola Producers Commission to visit the farm of one of the many producers of Canola here in the province. Jack and Sharon Moser own a farm in Killam, Alberta, which is about two hours outside of Edmonton. On 4000 acres of land they produce barley, wheat and canola. When I think of the Alberta prairies, the picture that comes to mind is a bright field of yellow canola under a blue, cloudless sky. 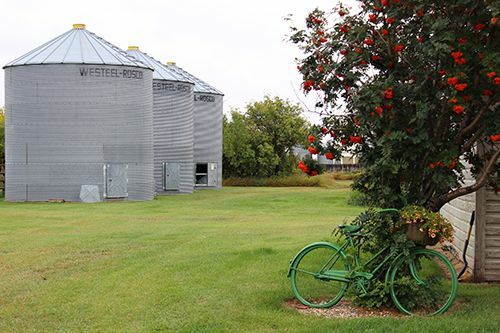 While the weather during the visit last week wasn't exactly ideal, the Mosers were amazing hosts as they graciously invited a small group of food bloggers and writers out to their farm so that we could get a sense of what it is like to farm and harvest canola. One thing I was really looking forward to exploring was this school bus. 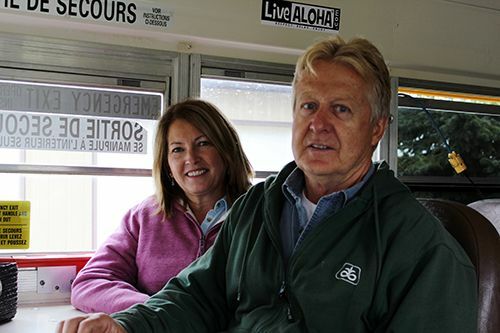 A few years ago the Mosers purchased this bus and converted it into a vehicle that they use on their farm annually during the month-long harvest. Now this is no ordinary school bus. Rather than transporting people, it transports dinner out into the fields for the hard workers that harvest canola. Every night that there are people working out in the fields, Sharon cooks up a hearty meal and loads it onto the bus. Meal time is at about 5:30PM and I'm sure that the bus driving into the field is a welcome sight for the workers. Meals can be anything that she would cook up for her own family. Beef and potatoes with gravy, lasagna, and fresh baked bread are just some of the things that are served family style on the bus. 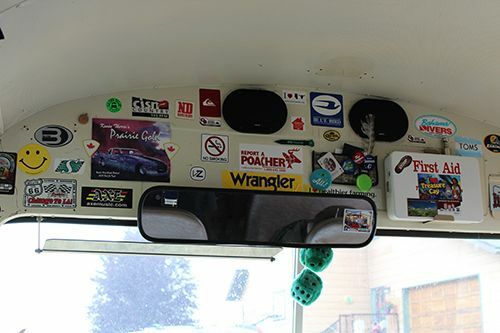 Over the years the interior of the bus has been decorated by all who have had the opportunity to dine inside of it. Decals, souvenirs from abroad and signatures in Sharpie are found on the walls and really gives this place a personality of its own. Aside from the decorations the interior of the bus is very different from your typical school bus. 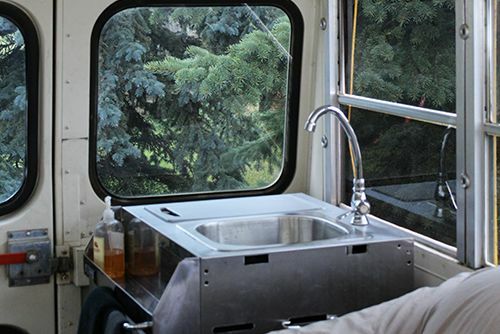 The back of the bus is outfitted with a sink where everyone is able to wash up before dinner. The traditional brown seats have been rearranged to face one another and a table is fitted in between. As there are usually about 5-7 workers harvesting canola, only two tables are required for seating during dinner. The remainder of the space houses two comfortable couches for relaxation during the break. For the Mosers it is really important to eat together like a family even during the busy harvest season. 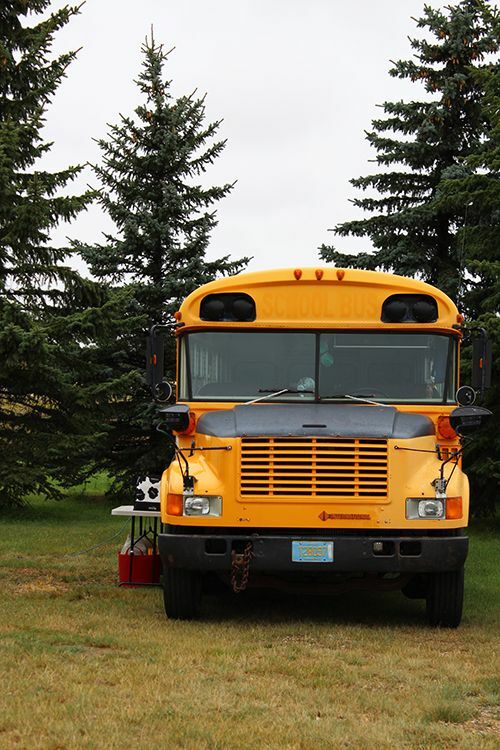 This converted school bus ensures that everyone can be together out of the elements to dine and relax partway through the work day. 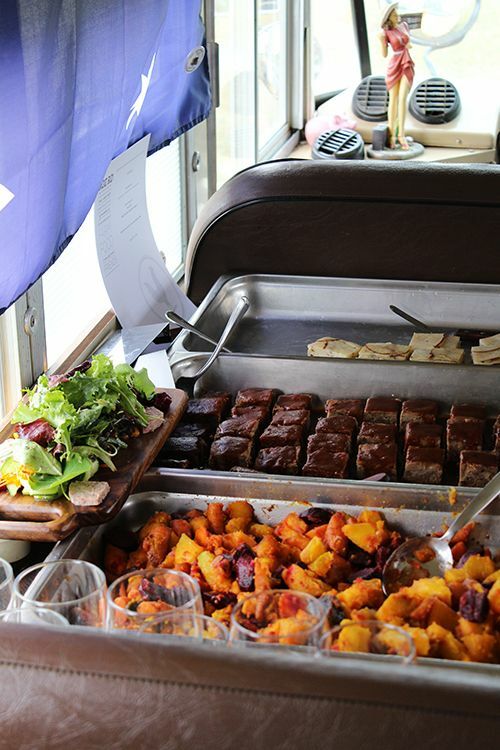 To get the full harvest experience everyone was treated to lunch on the bus. Chef Blair Lebsack of RGE RD was on site with his team and prepared an amazing meal using seasonal, locally sourced ingredients. We started off with the Edible Farm Salad, where 90% of the produce is from Edible Acres Farm. 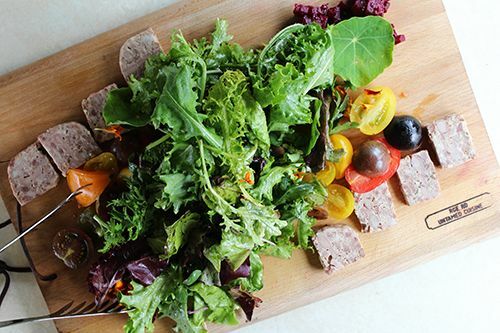 Alongside the salad greens were a beet antipasto, marinated cucumber, tomatoes and a pork terrine featuring the pigs raised by Natures Green Acres. The mains during lunch were served up buffet style, just as they would be served by Sharon on the bus. Beef compression, potato pave, and wood fired root vegetables with squash comprised the bulk of our meal, and every bite was delicious. Everything was flavourful and I loved that the beef compression was nearly identical in resemblance to a brownie. 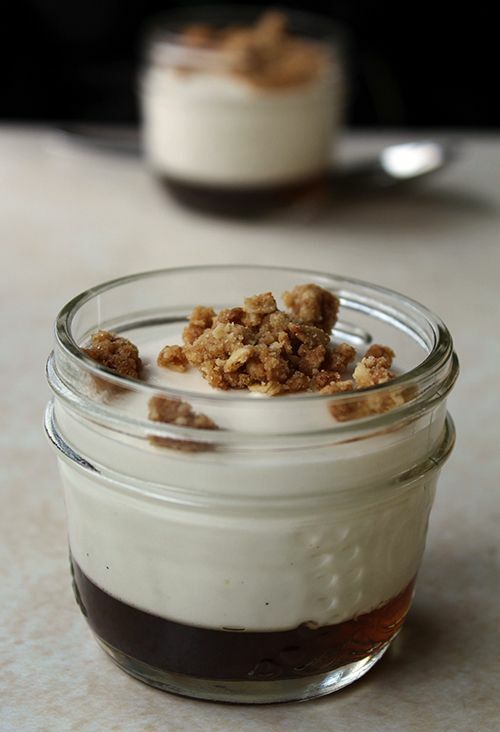 We were all lucky enough to be served dessert with our lunch, and this maple verrine with whiskey gelee and oat streusel was light and ended the meal on a high note. 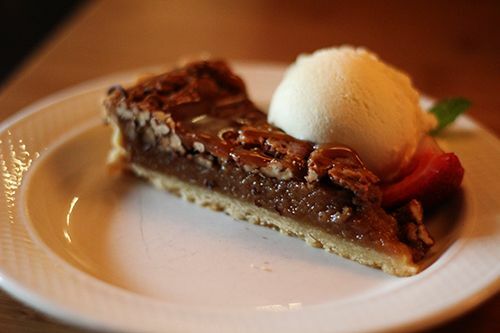 Look out for this dessert on the menu at RGE RD during the cooler months ahead. Canola oil has the lowest level of saturated fat - it is a heart healthy oil! What I thought would be a long drive for lunch turned out to be a really fun day learning about a valuable crop produced in the Canadian prairies. I learned so much about canola and am grateful to have met dedicated producers working day in, day out like the Mosers! I have to send a huge thank you to the Alberta Canola Producers Commission for inviting me out to the farm, and to Sharon and Jack Moser for being amazing hosts! And of course thanks to Blair Lebsack and his team for an outstanding meal as usual. If you're ever interested in checking out your local farm in Alberta, check out Alberta Open Farm Days where you can learn where your food comes from. Open farm days are over for 2014 but I encourage you to search locally for farm tours or wait for the 2015 event! It is so great to learn about your local producers and support them in all that they do. This summer I was really looking forward to the opening of a new restaurant headed by the Tres Carnales - Daniel Braun, Chris Sills & Edgar Gutierrez. 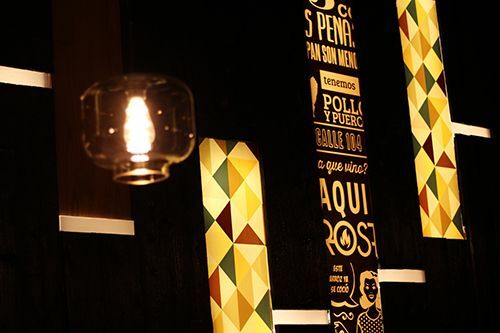 After Roast Coffeehouse + Wine Bar suddenly shut down at the end of 2013, the three business partners took the opportunity to seize the space in the Mercer Warehouse and open up Edmonton's newest Mexican sensation: Rostizado. During my trip to the Mayan Riviera in April I managed to learn a couple things in Spanish. 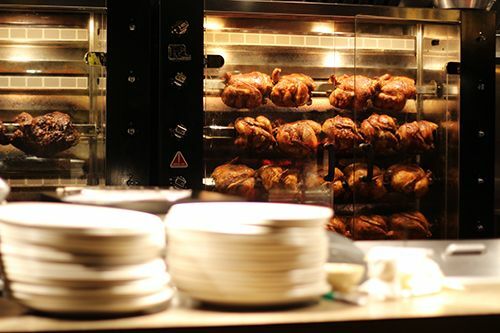 One of the phrases was "pollo rostizado," as it was on the menu of every single snack bar on the resort. 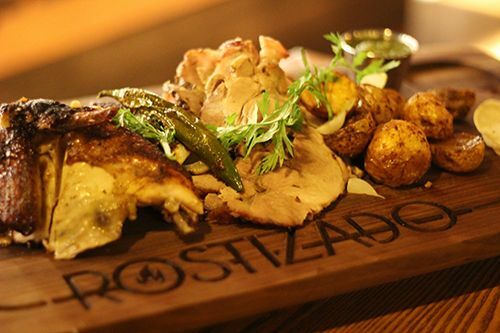 I figured out that rostizado meant "roasted," so you can imagine how excited I was when I learned about the name of the Tres Carnales' newest venture. Roasted meat, Mexican style. Yes! Ever since my return from Mexico I've been craving good Mexican food and this was the answer to my prayers. I've probably eaten my weight in guacamole and pico de gallo since coming home, so it was time to switch things up a little. My boyfriend and I decided to drop by for dinner a couple days after opening. Just as I had expected, the restaurant was packed on a Friday evening at 5:30 PM. We managed to snag the last two seats facing the open kitchen and had some housemade bar snacks while perusing the menu. 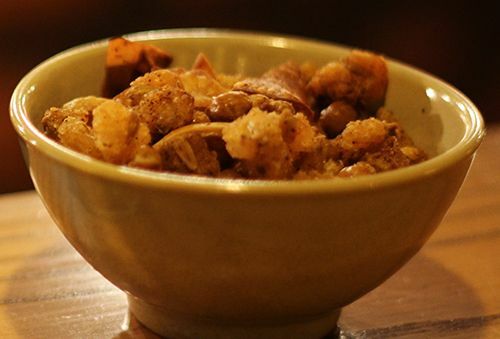 The little dish consisted of a spicy, tangy mix of chickpeas, yam chips, corn nuts and tortilla crisps. It was salty, crunchy and super addictive. I could eat it everyday. Although not mentioned on the menu, we ordered a black coffee ($3.50) and we were surprised to get coffee with a Tres Carnales twist. The coffee had an addition of a housemade syrup with notes of cinnamon, cloves and orange, among other things. 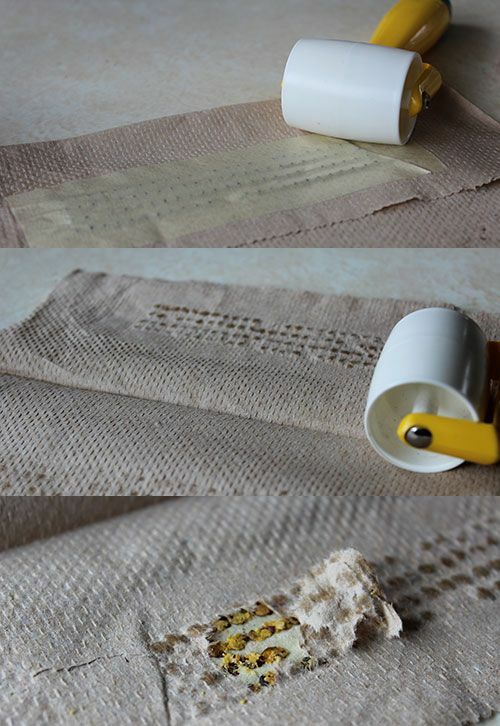 Definitely something unique to try. Between the two of us we decided to split the Rotisserie Platter for 2 ($55) which featured their rosti-pollo (chicken) and rosti-puerco (pork) with a side of rosti-papas (potatoes), tortillas and salsa verde. This platter was one glorious pile of meat. The roasted chicken was tender but the breast was a little drier than I would have liked. The clear winner on this platter for me was the pork, as it was juicy, tender, and well seasoned. The potatoes were roasted with the drippings from the meats, making them absolutely delicious. The spicy flavour kick, crisp skin and tender interior made these potatoes the perfect accompaniment. The meats combined well with the fresh kick of the salsa verde, but we wished more tortillas were provided on the platter given the amount of meat. Worried that we wouldn't have enough food, we decided to order a side with our platter. 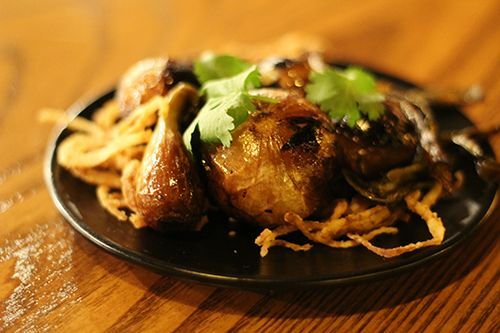 It was a tough choice but we picked a half size of the Charred Cebollitas ($7): grilled spring onions marinated in soy sauce, salsa maggi, lime juice & black pepper. The description of the onions really stood out to me and the first bite into one confirmed that we had made the right decision. The charred outer skin gave these onions a great smoky flavour, but biting into the crisp, sweet flesh was the best part. The soy-based marinade really soaked into the onions and every bite was a juicy flavour explosion. To finish off the night we had to get the made-to-order Churros Con Dulce de Leche ($8). When I was in Mexico I always slathered my churros with dulce de leche, so these ones had a lot to live up to! 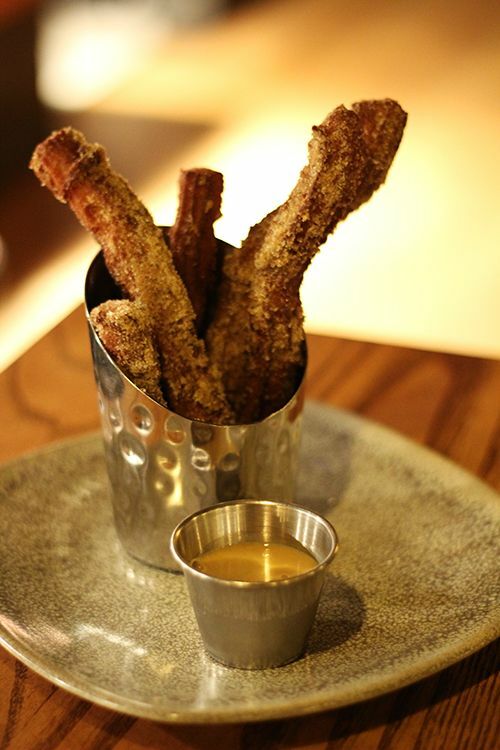 The churros at Rostizado came piping hot to our table, coated in cinnamon sugar and ready for dipping into the dulce de leche. The first bite was so satisfying! The crispy exterior gave way to a creamy, chewy centre, and the caramel flavours of the dulce de leche paired perfectly with this deep fried treat. I found some pieces to be heavily coated in sugar, but that was easily remedied with a light tap. I do wish the consistency of the dulce de leche was a little thicker, but only so that I could get way more coated onto my churro with each bite. Mmm. 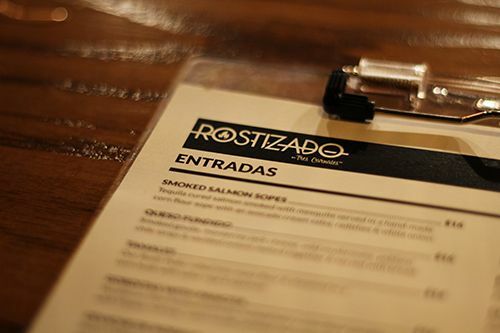 Rostizado is definitely a hit here in Edmonton and a very welcome addition to the downtown dining scene. The space is modern, staff are friendly, and the food is fantastic. I really enjoyed the upbeat environment, but the dim dining room allows for intimacy as well. In terms of pricing, the rotisserie on the menu does run on the more expensive side of things but they offer some great sandwich options at a lower price point that feature the roasted meats. So what are you waiting for? Get on down to Rostizado, and quick. They don't take reservations! Sometimes when I read restaurant names I have to do a double take. That's exactly what happened when I discovered a local restaurant advertising that they serve both pizza and Vietnamese food. Say what? I was so curious to see whether this place was any good, and I was actually interested in trying their pho. Now I know what you're thinking - I must be crazy to think this restaurant would serve top notch pho! But hey, someone has to take one for the team, right? I was able to convince one of my friends to go on this adventure with me so we showed up at the restaurant at about 6PM on a weeknight. Bad news, the place was empty. We were greeted and seated in the corner before our server ran off and hid in the kitchen. 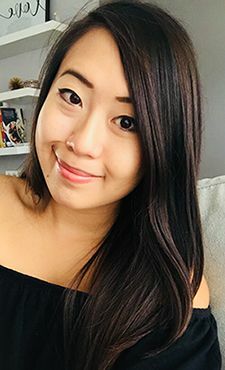 The restaurant itself looked small and, like a typical Vietnamese restaurant, had sriracha, hoisin sauce and other condiments available on the table. 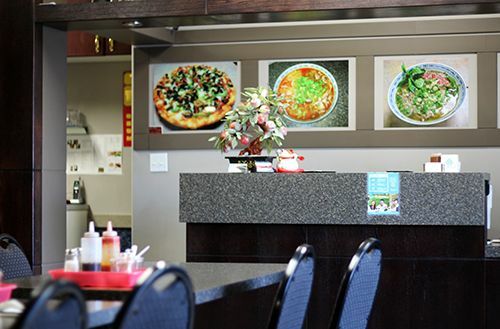 The menu was mostly devoted to Vietnamese noodles and soups, but a whole page was dedicated to a wide variety of pizzas, salads, burgers and fries. It's the strangest thing, but it apparently works for the loyal patrons of this restaurant! My friend ordered the Grilled Pork & Spring Roll Vermicelli Bowl (#24, $8.75) and it was a fairly generous serving. The vermicelli noodles were cooked al dente and served overtop of the usual fresh greens like lettuce, cucumber and sprouts. The grilled pork was moist, tender and full of flavour, while the spring rolls were crisp and golden. Things were off to a good start! Most of the pho offerings on the menu ranged between $7.50-$8.50 depending on the choice of meat and size of the bowl. For myself I was craving pho with beef balls and tripe - a combination that rarely exists on Vietnamese menus. However, the restaurant was more than willing to accommodate my request so I got exactly what I wanted. The bowl of noodle soup really didn't look like much, but the broth was fragrant with a nice depth of flavour and was served steaming. 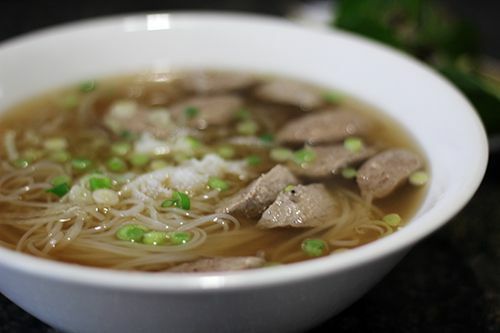 Although I would have liked a bit more tripe in my bowl, this bowl of pho would definitely hit the spot on cold day. 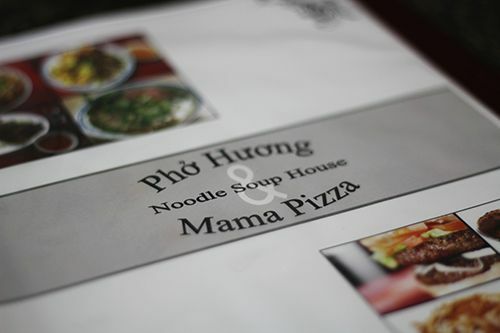 Pho Huong & Mama Pizza is a family-run business and our server (who I believe was the owner) was very friendly and inviting. The restaurant is located in an area of the city that is a little more run-down, but appearances can definitely be deceiving. The interior of the restaurant is updated and well kept, and almost seems to be out of place given it's location. 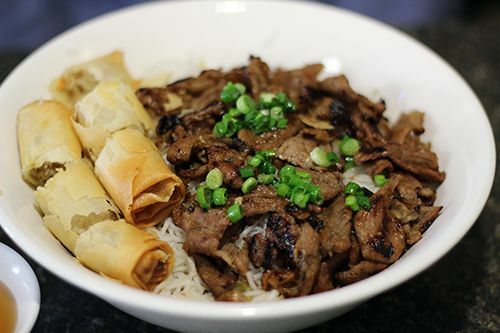 If I were in the area and craving Vietnamese, I wouldn't hesitate to drop by for a quick meal. I'm a little curious about the pizza - who knows, it could be a chance worth taking on my next visit! Happy Monday! It's Labour Day long weekend and the sun is out shining - hope you all have the day off to enjoy the last bit of summer! 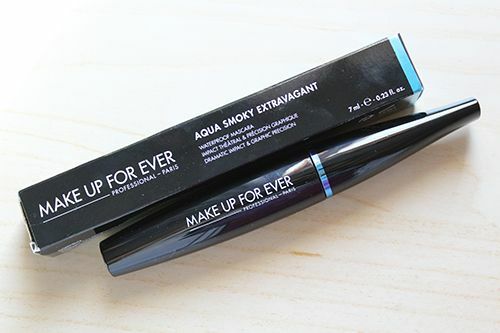 Back in June Make Up Forever released a brand new mascara formula to the market. 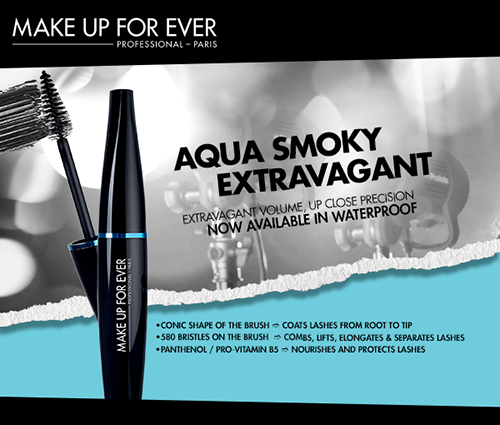 The Aqua Smoky Extravagant mascara is a follow up to the original Smoky Extravagant mascara, but with the promise of being waterproof, which is definitely important for the summer months! Aside from being waterproof the formula promised volume, length, curl and precision - that's definitely a multipurpose mascara if you ask me! 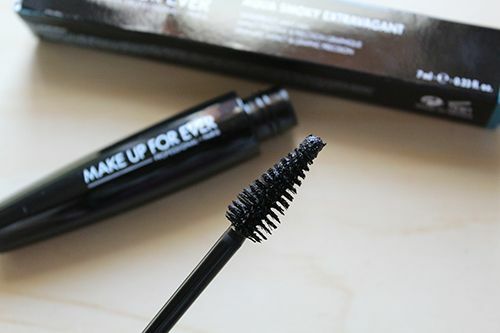 Make Up Forever's new formula is made with micronized iron oxide to give the mascara an intensely dark pigmentation, and the micro particles are able to better coat the eyelashes. As the pigment is natural they claim that the formula is safe for use with contact lenses or individuals with sensitive eyes. I've spent the last month testing out this new mascara formula and I would have to say it's a must-have for the summertime. Packaging is simple and sleek, though I wish it were a little smaller to be travel friendly. As promised, this formula is as black as black can be. Looking at the wand, the conical shape is one of the best things about this brush. The tip allows for easy application on the inner lashes while the fuller section effortlessly coats each lash from base to tip. The brush separates lashes, gives them length and volume, and my lashes remain clump free after application. It's a lightweight waterproof formula that holds curl and easily removed with makeup remover. At $28 its a bit of a splurge for mascara, but after seeing it live up to its promises this product is on my must-have list for summer makeup. Available at Make Up Forever boutiques and Sephora across Canada.